Illustration by Tori Lind Kjellstad, check out Hyggelig drittsekk for more. Last night I was at my boyfriend’s Birthday party, and when the Norwegians around me started singing “Hurra for Deg som Fyller ditt år” I thought “Oh damn, I still haven’t learned that song”. Then I fell in shame (as I usually do when this happens) and looked at other people and tried to remember the lyrics. I tried to hop and turn and stuff at the right moment, and hoped nobody would notice. But during the song I looked at the other foreigner in the room, a Colombian guy, and realised he was just saying “Ta ta TA ta” and eventually very loudly “GRATULERER” at the end of the song. “You don’t know that song either, right?” I asked afterwards. THANK YOU I am not alone!! I have been here for 8 long years and never managed to learn the Norwegian Birthday song. This girl is really not trying to integrate, you might think. Well, yes I am. And I have. I speak and write Norwegian. I have Norwegian friends, and even have a Norwegian boyfriend who laughs hysterically every time he sees me struggling with the song. “It is so simple!” he says, and then he goes on singing obscure lyrics very fast. I have elected this song the most difficult Birthday song in the world. It not only has a lot of lyrics, it also requires dance moves. It has an unbelievable amount of lyrics. In English, all you need to learn is “Happy Birthday to you”. You repeat that a certain number of times, sometimes with the name of the person you are celebrating with. Number of brain cells required to sing this song in English: 3. Number of minutes one needs to remember this sentence: 2. In Norwegian you need to learn minimum 9 sentences, none of them repeating itself at ANY point. (There is of course a second verse which has even more lyrics, see below). The sentence structure of this song is very strange. It comes from old fashioned Norwegian (or should I say Danish?). Example: Alle i ring omkring deg vi står. Nobody ever says it like that in real life: Everyone in a circle around you we stand. Ønske deg av hjertet alle gode ting: Wish you from our hearts all the good things. And what on Earth does Og si meg så mean? Now try saying all these sentences very fast, in tempo, with the right melody, and with THE MOVES. Then you also need to learn when to hop and turn and bow. Yes, dance moves are required. And at the right moment in the song. Just look at the Prince and Princess singing for the King’s birthday if you don’t believe me. Translation of verse 1 is taken from Life in Norway’s article on the topic. I am telling you, this is an exercise to make sure Norwegians don’t get Alzheimer’s too young. Keeps them active and sharp. 4. Why such a complicated song? Is this part of the Norwegian values? This could really be a test for foreigners in Norway, because it is so hard. I am guessing Sylvi Listhaug will soon ask for foreigners to sing this song when wanting to cross the Norwegian border. If you don’t sing the lyrics right or don’t twirl at the right moment, you’re OUT! After having passed the test of eating a whole pack of Brunost and skiing without falling of course. Don’t worry, for now the best reason to learn this song is not to feel like a fool at birthday parties. Yes now we’ll really celebrate! And one of us shall be the next! 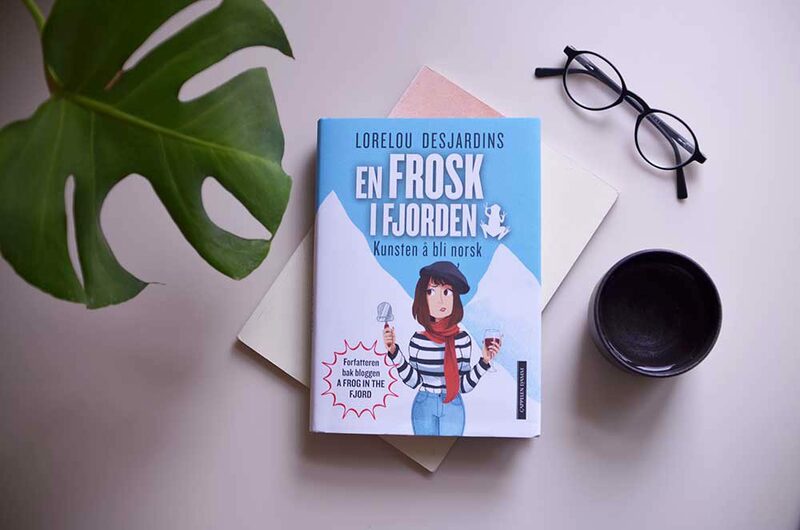 If you want to laugh real hard, I was interviewed by the Norwegian radio NRK P1 on the program Norgesglasset, and they asked me to sing the song, or my version of it. Listen here to the podcast. To thank you for reading until the end, an illustration a little bit more edgy than the first one 😉 They do look like they are on happy drugs sometimes, don’t they? Anyway, thanks so much for making me feel like less of an inept human for not knowing the Norwegian birthday song already. I shall sleep soundly tonight. Hi. I am so glad to have found this comment. I was looking around to see if there could be some interest if I wanted to create a youtube video on this song, and now I know. I will make that and upload it on my channel! HI Lene, great to see that you are inspired by my blogpost! It has been shared over 5000 times on Facebook, and was published in VG here: https://www.vg.no/nyheter/meninger/i/Eobzzl/den-umulige-bursdagssangen. Please do refer to my work with the name of my blog and of the article when you make your video, and we might even be able to make one together one day. “Og si meg så” means “And tell me then”. And no worries, you’ll get the hang of it. I learned the song by, well, listening to others sing, not like I was taught this song or the moves. 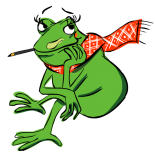 The song is traditional, written by Margrethe Munthe (https://en.wikipedia.org/wiki/Margrethe_Munthe ) who lived 100 years ago and wrote a number of “educational” childrens’ songs meant to teach kids how to behave – old style! Hahahaa, exactly!!!! I’ve always thought the same – I’m not living in Norway but I speak norwegian, so I watch a lot of norwegian TV and that damn song is included everywhere all the time! Maybe I’m gonna learn it now as you wrote down the text, I was always too lazy to find it myself :-). Thanks, I enjoyed this post a lot!. And it’s not actually very easy, is it? I’m at least glad we don’t have the boring «Gratulerer med da’n», as someone translates it to. I am one of the few who actually knows both of the verses. In school we always sang both, and on the second verse the birthdaygirl- or boy got to choose a friend to dance with. To add insult to injury – the last stanzas of the two verses transcribed in the post are not part of the original lyrics. People just feel that the original verses leave something that should be added. YES! 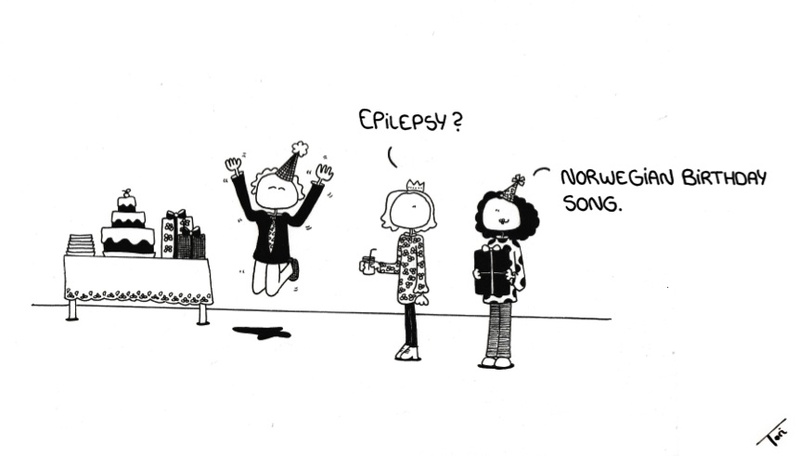 I have to make sure I have proper Norwegian adults with me at my children’s birthday parties – no way I could ever lead the singing of that song! 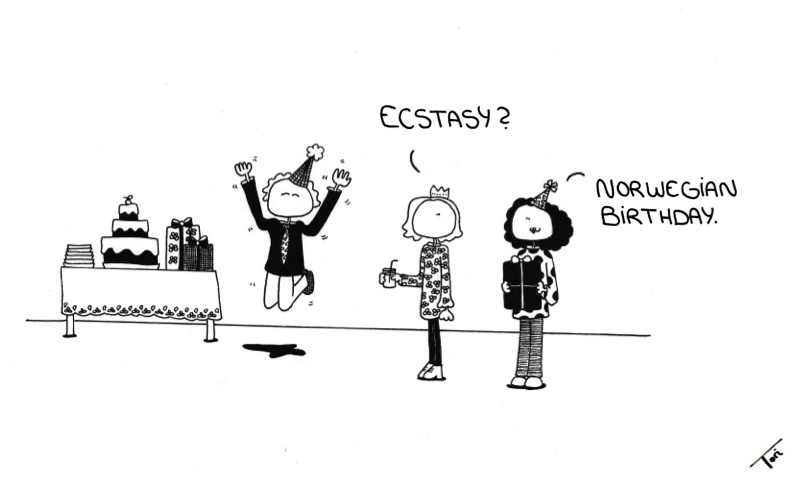 If you can sing this birthday song, you are a Norwegian. The song was originally written in 1911 by Margrethe Munthe, a famous Norwegian child song writer. She wrote it in Dano-Norwegian, that’s why it has somewhat strange expressions. Here are the lyrics in Nynorsk, the modern Norwegian language which about 15 % of the population use. ja deg vil vi gratulere ! og sjå no vil vi marsjere ! og sei meg så kva vil du meire ? Høgt våre flagg vi svingar. Hurra ! Ja, no vil vi retteleg feste ! men du er den aller beste ! Sjå deg om i ringen, kven du vil ta ! Dans ein liten dans med den du helst vil ha ! for ein av oss skal bli den neste ! The phrase “Happy Birthday” is Lihkus Riegadanbeaivvis. This is sooo true. I’ve been here thirty years, and I still haven’t learned it properly. And I’ve never even heard of the second verse – where did you find that?! ?